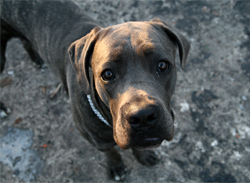 Shop for your dog's vaccines at VetDepot.com. You may think of rabies as a disease whose time has come and gone, but statistics show that this is not the case. According to the Centers for Disease Control (CDC), every year an estimated 40,000 people in the United States are treated for potential exposure to rabies and 55,000 people die worldwide from the disease. Knowing a little about rabies will help you protect yourself, your family and your pets from this deadly disease. Rabies is caused by a virus that is transmitted through the bites of infected animals or through direct contact between their saliva and open wounds or mucous membranes on a person or animal's body. Contact with wildlife (primarily skunks, raccoons, foxes, coyotes and bats) is the most common way for dogs to become infected with rabies. When a dog is bitten by a rabies-infected animal, the virus travels from the wound through nerve cells towards the brain. It can take weeks or even months for the rabies virus to make its way to the brain and for symptoms of the disease to develop. "If your pet has been exposed to a potentially rabid animal call your veterinarian immediately." The earliest signs of rabies can be a change in behavior. Outgoing dogs may want to be left alone or aggressive animals might all of a sudden act in a friendlier manner. As the disease progresses, the clinical signs become more profound. Over time, infected animals move from the furious to the dumb form of the disease. Once symptoms develop, death will occur within ten days. If a dog does not have a current rabies vaccine and develops any of the symptoms of the disease, a veterinarian will first limit the pet's exposure to people and animals and then try to rule out other medical conditions that cause similar symptoms. If diagnostic testing does not come up with another explanation for the dog's symptoms, the veterinarian will probably recommend that the dog be euthanized and tested for rabies. Unfortunately, no test is available that can identify rabies in an animal while it is still alive. Once the clinical signs of rabies develop in a dog, the disease is fatal and treatment is useless. Thankfully, preventing rabies is extremely easy and inexpensive. Rabies vaccinations, given on a schedule determined by your dog's age, type of rabies vaccine used and local laws not only protect pets, but also the people who come in contact with them. Except in the rarest of circumstances, all dogs should be vaccinated against rabies. If your pet has been exposed to a potentially rabid animal call your veterinarian immediately. Dogs that are current on their rabies vaccines will probably need a booster and to be quarantined for 45 days or so (this can often be done at home). If your dog does not have a current rabies vaccine, euthanasia will probably be recommended. If you do not permit this, a strict quarantine of six months or longer will imposed. When a person has been bitten, contact a doctor immediately. Pets that bite people need to be quarantined for ten days. If the animal was capable of transmitting rabies at the time of the bite, it will die within this ten day period. Pets that are still alive at ten days could not have transmitted rabies at the time of the bite. The details of rabies quarantine and post-exposure treatment depend on local laws so always talk to your veterinarian and/or medical doctor if contact with a potentially rabid animal has occurred.